One of the most common questions asked whenever a major sporting event like the Tour ta' Malta is held on our islands, is about the possibility of seeing a local winner. It is never an easy question to answer because there are far too many factors to consider, not least the quality of the field. There is, however, one certainty... the likes of Maurice Formosa, Christian Formosa, Jason Vella, David Galea, Steve Sciberras, Adrian Sciberras, Dermot Galea and Mark Bonnici will all be pushing as hard as they can to give a good account of themselves. Then there is Etienne Bonello, so often the leading Maltese man in past editions of the Tour. His is the name that gets mentioned most frequently whenever there is talk of possible Maltese winners. "After so many near misses, my name always comes up as the Maltese tour hopeful," Bonello acknowledged. "However, there are other riders who can also challenge for the top positions. It would be great to have many Maltese up front and fighting it with our guests." It won't be at all easy, not least because the foreign teams come with a strategy to back their leading rider and put him in the best position to win. Split as they are among different teams, it is difficult for the local riders to react. Bonello, however, is hopeful that national pride comes ahead of club rivalry. "Foreign teams come with a group of riders who are of almost the same ability," Bonello said. "That is very important as you can play many cards. 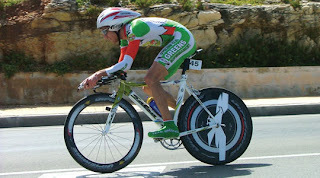 Maltese teams tend to have only one or two strong riders. I am hoping for an alliance between the top Maltese riders. It happened last year and I am sure it will this year as well." If that does come about, then perhaps we could get a step closer to seeing history being made and the red jersey of the Tour winner going to a Maltese. "So far, no Maltese rider has ever won the Tour and this is enough for any Maltese cyclist to take up the challenge and be the first to stand on the highest step of the podium," Bonello commented. "The Tour is an important race for local cycling indeed. It is as important as the Malta marathon is to the Maltese runners. This race helps in the development of the sports in Malta. "It gives an opportunity to local cyclists to race against foreign competitors and improve themselves through experience. "The Tour is the best promotion for cycling on the islands as it attracts media attention and there is increased following from the public." For the first time in seven years, this year's Tour ta' Malta will include a leg in Gozo and Bonello, for one, certainly approves. "The proposed route is really challenging," he said. "The first stage is a lengthy time trial and if one is not a decent time trialist, one will lose plenty of time there. San Martin, I think, is the toughest of them all. It is a hilltop finish and after 10 laps, it will get really hard in the end for everyone. "Gozo is a fast route despite the climb to Xaghra. It was a good choice by the organisers to incorporate this circuit, it will make the Tour more interesting. Well done to the organisers." Last year's winner, Francesco Guccione, will be on the start line to defend his title. He is set to face a major challenge for the red jersey from fellow Italians Filippo Ballatore and Francesco Pizzo. Looking at the list of foreign riders coming to Malta, Bonello admitted that "this weekend will not be easy riding the bike for sure." That said, the memory of former association secretary Cliff Micallef, who lost his life in a traffic accident last year, will surely spur the over 40 local cyclists on. They will be joined by 60 foreign riders coming from Italy, England and Holland. This article was featured on the Times of Malta of the 18th of March, 2010.